Electric Playground takes its name from Electchester Homes, a housing development opened from 1951 to 1954 through the efforts of Harry Van Arsdale (1903-1986), head of Local 3 of the Brotherhood of Electric Workers. The 38-building community was built in response to the housing shortage faced by city residents after World War II. Electchester homes rest on the former grounds of the 136-acre Pomonok Country Club, whose 300 members voted to disband in 1949. The members of the union each contributed $100 towards the Electchester’s construction, with the union matching the amount raised. The Brotherhood of Electrical Workers also donated land on the grounds for the construction of P.S. 200 and Electric Playground. The kite with key, light bulbs, and eels that adorn the play equipment at Electric Playground are linked by the common theme of electricity. Electric eels (Electrophorus electrius) are able to produce high voltages in order to stun prey. The light bulb and kite with key symbolize two important achievements in the understanding of electricity. Humankind’s awareness of electricity began with the Greek philosopher Thales of Miletus, who was the first person to record his experiments with electricity. In the fifth century BC, Thales noted that amber could acquire the power to attract small objects. Three centuries later, another Greek thinker, Theophrastus, wrote that this power is common to other objects as well. The word “electricity” was coined by the English scientist William Gilbert and is derived from the Greek word elektron, meaning amber. In the 17th century Gilbert conducted the first major scientific study of electricity, cataloguing the forces that different objects acquire when rubbed. The first electrical condenser, the Leyden Jar, developed in 1745, consisted of two pieces of tinfoil attached to either side of a glass jar. The contraption produced a spark when touched to a device that created static electricity. However, a unified electric theory was not proposed until 1747 when the acclaimed scientist and American statesman Benjamin Franklin (1706-1790) developed a “fluid” theory of electricity. Franklin postulated that lightning was an electrical phenomenon and was made of the same “fluid” present in the spark of a Leyden jar. Franklin’s theory called for two forms of electricity, positive and negative, and was proven by experimentation in England and France before Franklin’s famous kite experiment in 1752. In his experiment, Franklin flew a kite in a lightning storm so that charge from the lightning flowed down his kite’s string to a key attached to the end. A piece of metal attached to the key then acted as one pole of a Leyden Jar, creating the same spark as other forms of static electricity. In 1880 Alessandro Volta created the battery, the first artificial electrochemical source of potential difference. The battery was improved upon by Thomas Alva Edison (1847-1931), who was responsible for most of the advances in electric technology that took place over the next fifty years. Working from his laboratory in Menlo Park, New Jersey, Edison invented the phonograph in 1877, the Kinetoscope (a precursor to the motion picture projector) in 1888 and the world’s first incandescent light bulb in 1879. Over the next decade, Edison worked to make the implementation of his light bulb invention more feasible by improving the generators and dynamos necessary to deliver current to the bulb. Because of its practical nature, electric lighting grew in popularity and, in 1882, Edison was commissioned to build the world’s first centralized power station, located in New York City. The City acquired the property for Electric Playground on November 15, 1951, and Parks immediately obtained jurisdiction over the property. 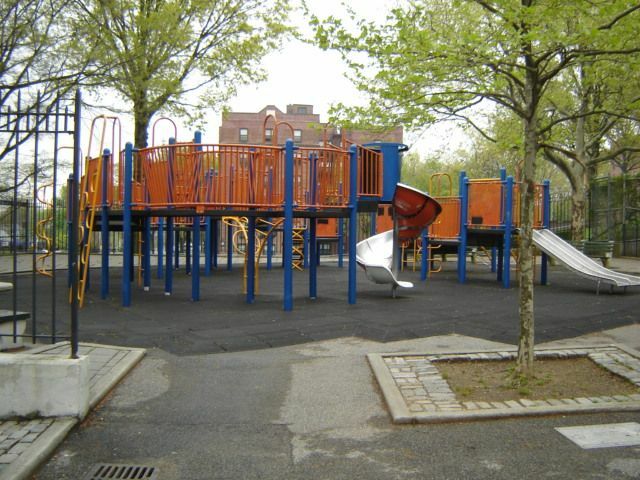 Commissioner Stern named the playground on April 8, 1998 before a $550,000 renovation, funded by Council Member Morton Povman, which gave the park its current electric theme in 1999. Electric Playground also features a Franklinia tree (Franklinia alatamaba), named in honor of Ben Franklin, street lamp, and wire shaped play equipment, one full and two half basketball courts, two handball courts, and a backstop for games of baseball. 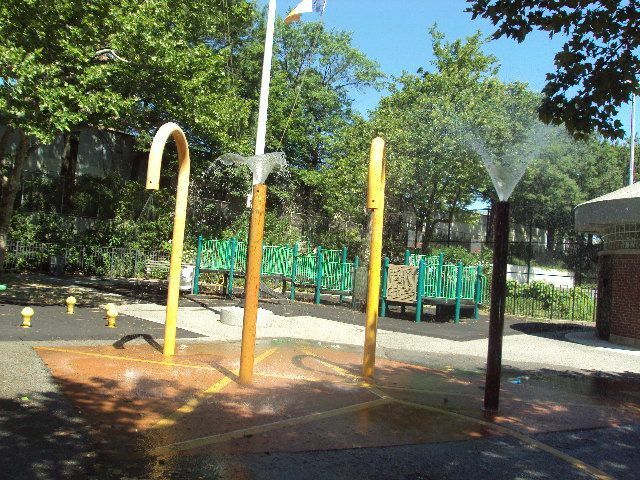 Despite the park’s name, all play equipment is electrically neutral and thus safe for children of all ages.